I was originally asked to write this piece for the Football Reporters Online NFL Draft guide. Unfortunately, the guide was not put together for release. The piece focuses on the New York Jets, their fans, MetLife Stadium, and PSL’s in regard to the Jets. The idea that a PSL is “an investment” is discussed in contrast to those who want them for future generations. This is a topic I have covered countless times. I did not want this piece to sit in limbo for eternity. Every Jets fan has their opinion on the PSL’s. They are also outspoken in regards to other teams possibly entertaining the PSL idea. The story never changes, but every once in a while new pages need to be added for a deeper in depth story. Since 1996, football has watched itself grow beyond the typical funding, state grants, and loans that it takes to create and furnish a new stadium in the NFL. The advent of the PSL has created opportunities for some but has also turned off many depending on the team you are a season ticket holder for. When it comes to MetLife Stadium and the New York Jets, what was supposed to be a worthwhile “investment” turned into turmoil for many. When the New York Jets announced that they were going to use PSL’s to help finance the new stadium, it was met with mixed reactions. Especially from those long time season ticket holders who had been with the franchise since the Polo Grounds and Shea Stadium. 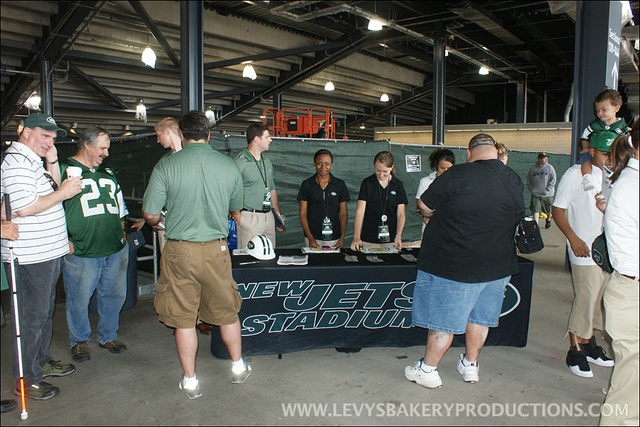 Many fans have been with the Jets, supporting them in every situation and season longer than any staff member associated with the team. That shows dedication while Jets’ employees will always move on. The term “investment” has been used loosely when it comes to the purchase and ownership of a PSL. People are split on this concept. Many long time season ticket holders want to hold onto their seats. Like many before them, retaining them in order to pass them along to a younger generation to enjoy. Others “invest” in a PSL and sell the season tickets in hopes of making a profit selling the tickets either on a game by game basis or the entire season. As many Jets fans know today, that is nearly impossible. This past season, tickets were being sold for a fraction of their face value. Some went through Stub Hub and purchased seats for each game, sitting in the same seats as if they owned a PSL. Since the Jets introduced the PSL’s, I have related them to holding stock. A flat value paid to a company in hopes that they value of said “stock” would rise due top the performance of the team. No one owns one PSL, the minimum would be two seats or two shares in the team. That PSL money helps to fund the stadium along with other “seat investors” and the Jets organization itself. After that flat investment was paid, for example, 5,000 per seat just to be able to have the right top purchase season tickets. The PSL only give you a license to purchase your tickets in the lower and middle tiers of the stadium while the upper part of the bowl is a complete NON PSL section. So after you have your seats and tickets for that flat price, it is now up to the Jets and their team performance to determine what the future value would be for those PSL’s. Just like any public company who offers any form of public stock, that stock value is determined by that company’s performance. Google continues to actively trade at a high price many are willing to pay while Facebook is struggling to even keep its shares at a reasonable price. There are many variables that determine what the stock price would be worth. But the main question remains, is this investment the best value for my money? Will I get a return on my investment? Is the company’s performance in the short-term and the long-term enough to be worth my time and money? New York Jets fans ask themselves those same questions. Since the beginning, the Jets have restructured prices & PSL structures in an effort to keep seats filled for more than one game. The Jets performance has been sub par at best. Performance has been below expectations. The organization and the team have not risen to the occasion that their investors (fans) would have hoped for. Especially in this new Roman Colosseum they built for the VIP’s and corporate sponsors. The Jets have done nothing to raise these values with a New York Super Bowl less than one year away. When a company is not performing to expectations, investors have certain rights to make changes in a company to ensure their investment does not hit bottom. But the Jets are not a public company. PSL holders can complain but the ultimate decision still lies within the Jets executive offices. Even though the Jets on field performance has not met expectations from investors, all they can do is sit back and hope the decision makers in charge do the right thing. Not just to increase performance and value, but for their fans as well. Recently, the Cleveland Browns did away with their PSL structure. Starting this season, new season ticket holders only have to pay for their tickets. Current PSL holders will have the opportunity to add-on new seats without having to pay for a new PSL and still maintain their PSL holder privileges. The Browns organization is doing this to help raise attendance and draw fans back to live games. The Jets and Woody Johnson can learn from other teams examples and not just leave an upper bowl with Non PSL seats..
PSL holders for both the Jets and Giants are offered opportunities to purchase tickets for other events at MetLife Stadium. It may not be in their seat or section, but they do get offers first before non PSL holders or the general public. The true test of this benefit will come during next year’s Super Bowl. Will these PSL holders be offered any kind of seat, even if their respective team is not in the Super Bowl? How will the Jets and Giants handle ticket disbursement for the Super Bowl to their PSL holders? There are so many questions and not enough answers when it comes to PSL’s and the benefits it covers, regardless of the team. But one thing is clear, the more you pay for your seat location, the better your benefits and the better you are treated y that respective organization. On June 16, 2010, the Jets held an open practice at the still being constructed MetLife Stadium. Many tables with sales representatives we strewn about talking up season tickets and PSL packages. They were in their collar shirts and khakis and offered up the usual brochures to passing fans who wanted more information. The sales representatives for VIP sections, Coaches Club sections, and luxury boxes had a very different approach. Clad in suits and offering up sales pitches to those who want to spend at least six figures per season were treated very differently. As I followed one such sales agent, I heard him tell his prospective client the following: “you would receive the same treatment we reserve for Woody Johnson.” Was this a part of the sales pitch? Was it right to tell this prospective luxury box ticket holder he would be treated differently than those fans who or for a PSL in the lower bowl or even a NON PSL holder in the upper deck? It does appear the Jets do not treat all their fans as equals. In one such case with luxury box holder, Jack Usman, who I interviewed in the past said that “his sales representative had been dressed so provocatively in the shortest, tightest skirt and the highest heels he had ever seen”. He was amazed how a sales agent would dress like that just to talk about a luxury box. All because he wanted to spend close to 1 million over three years on a box to bring clients. If he was just another fan, it would just be a phone call and a package sent to his house. In this age of “he who spends the most wins” has taken its toll on professional sports. One used to be able to bring a family of four to a football game. These days, parents sometimes have to decide which child goes to which game. Forget about the cheap seats in the upper deck. What kind of experience is that for a childs first football game. To those in charge of those decisions, it does not matter. The only thing that matters is the bottom line, regardless of who occupies those seats. PSL’s may be a necessity for certain NFL teams to build their new stadium, but at what cost to their fans? Depending on the market you enjoy your favorite team in can also determine the cost of the PSL’s. So many factors affect price structures. The New York Metropolitan area just happens to be the most expensive market for professional football. 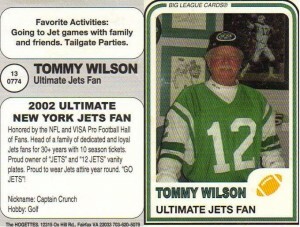 When the Jets rolled out their PSL’s there was a tremendous fan base shift. Many older, dedicated fans from the days of Shea Stadium and the Polo Grounds never stepped foot in MetLife Stadium. 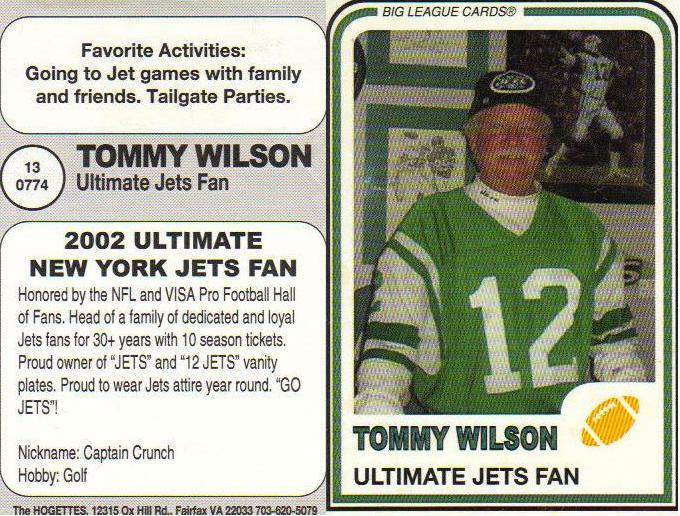 Some even passed away after making their initial PSL paymentt like Tommy Wilson. The man paid for the seats in October 2009 and only saw them from above. Professional sports have always kept up with the times, especially the NFL. With the modernization of new stadiums & being able to offer cutting edge amenities, comes a hefty price tag. One that gets passed to its fans in certain cases. None has been in a higher profile situation more than the New York Jets and their fans. This past season added more fuel to an ever going bonfire. The Atlanta Falcons have just been approved to be the latest franchise in the NFL to build a new stadium. A team on the cusp & capable of a Super Bowl appearance. Will PSL’s be used in the building of the new stadium? Will there be enough viable funding options to not lay a burden on the fans with PSL’s? Time will tell. If the Falcons organization needs to do marketing research to determine the fans options, Jets fans are always willing to share their opinions.